Alien Hominid is a 2D side scrolling action game where the player controls an alien that must fight their way through hoards of enemies to avoid being captured by the FBI. 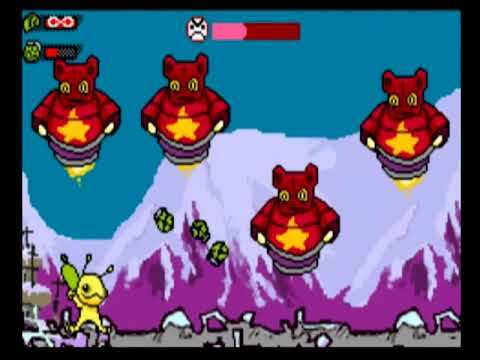 The player can pick up power ups for their gun and earn points for various actions. The game operates like an arcade game complete with a lives system and the difficulty is very unforgiving, but rarely crosses the line into being unfair. The game also supports two player cooperative play. The PAL version has various changes such as bug fixes, extra levels to the PDA game, and exclusive modes. Now you can add videos, screenshots, or other images (cover scans, disc scans, etc.) for Alien Hominid (Australia) (En,Fr,De,Es,It,Nl) to Emuparadise. Do it now!